The holidays are filled with tons of great treats and delicious things to eat, right? But then there's the opposite end of the spectrum-- like this candy. The list of incredible foods we tear into during the holiday season is almost endless, from those homemade Christmas cookies to holiday fudge, bars, and more. And let's not forget all those chocolates and other candies that find their way into our stockings too. But, even though there is a lot of great stuff we love to eat, then there are also those candies that nobody seems to like. 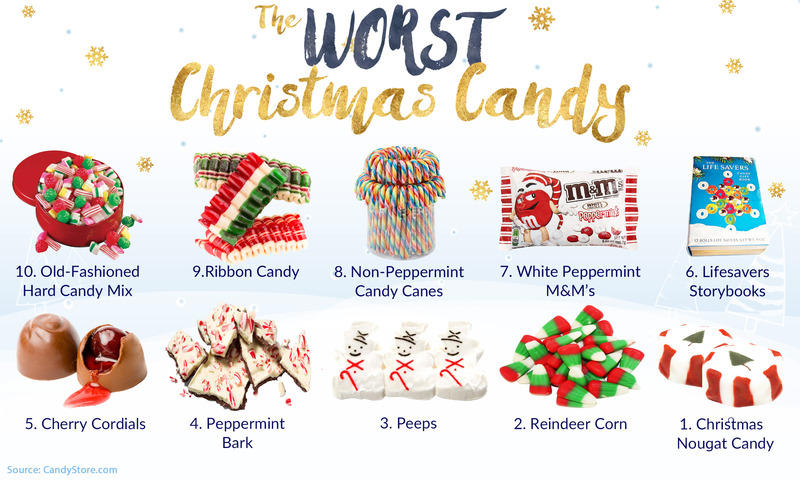 And, thanks to the gang over the CandStore.com, we now know just what is the worst Christmas candy. CandyStore.com notes that holiday candy is big business, with Americans set to spend an estimated 2 billion dollars on them this year. So, they surveyed their customers on which Christmas candy they like the least. And the result? Well, congratulations Christmas Tree Nougat-- you get the title of The Worst Christmas Candy! Of the 13,000 people that took the survey, this candy was voted the worst. "The Christmas tree nougat candies. My kid spits one out in my hand every year. The nougat with the tree on it. So so bad. No one ever eats that stuff and I feel like the noogat gnomes come around and collect it to sell the next year. Hard and stale, and the flavor is unholy," were some of the responses in the story.